Olive oil is a staple of the Mediterranean Diet and has been included in the diets of some of the world’s healthiest, longest-living people for centuries. Mediterranean populations have longer life expectancy and lower risks of heart disease, high blood pressure, and stroke. It is because the main type of fat found in all kinds of olive oil is monounsaturated fatty acids (MUFAs) – a healthy dietary fat. Olive oil is a fat obtained from the fruit of the Olea europaea (olive tree), a traditional tree crop of the Mediterranean region, where whole olives are pressed to produce olive oil. Not only for diet purpose, the oil is used in cosmetics, medicine, cooking, soaps, and was also used as a fuel for traditional lamps. Many studies have found that high monounsaturated fat diets lower LDL cholesterol, raise HDL cholesterol and lower triglycerides better than lower-fat, higher-carbohydrate diets do. The polyphenols in extra virgin olive oil also makes it an anti-inflammatory food and cardiovascular protector. The purpose of inflammation is to protect us against illnesses and repair the body when needed, but chronic inflammation is extremely harmful to arterial health and linked to heart disease, autoimmune disease and more. Eating plenty of healthy fats is a key element in controlling excess insulin, a hormone that controls blood sugar levels, makes us gain weight, and keeps the weight packed on despite us cutting calories and exercising more. Healthy fats like MUFAs are satiating and help reduce hunger, cravings and overeating. The brain is largely made up of fatty acids, and we require a moderately high level on a daily basis for our brain to work optimally. As a healthy fat, olive oil is also considered a brain food that improves focus and memory. It also helps fight age-related cognitive decline because it protects against inflammation, oxidative stress and prevent dementia or Alzheimer’s disease. Diets high in healthy sources of fat can help counter the harmful effects to our skin from exposure to toxicity, free radicals, UV light damage, and inflammation. The high content of vitamin E and other antioxidants in olive oil can also help hydrate skin, speed up wound healing, and help fight infections or hormonal imbalances that can lead to acne, eczema, and other skin conditions. Fatty acids influence glucose metabolism by altering cell membrane function, enzyme activity, insulin signaling and gene expression. 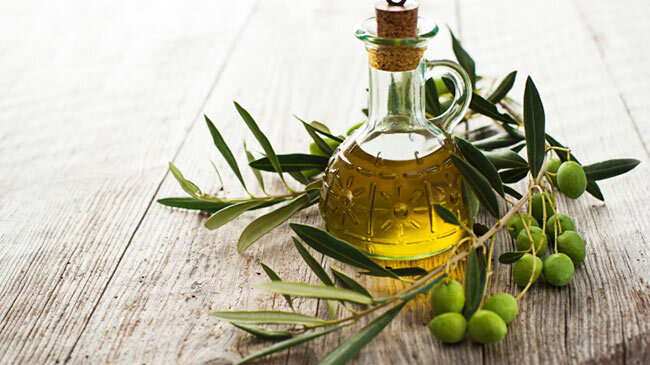 Research suggests that consuming polyunsaturated and/or monounsaturated fats (like in olive oil) has beneficial effects on insulin sensitivity and is likely to reduce risk of type 2 diabetes. It may sound unbelievable, but many people swear this works. Make a paste by mixing 4 tablespoons salt with 3 tablespoons olive oil. Pour the mixture onto your hands and fingers and apply it around your face. Leave it on for a minute or two, and then rinse it off with warm, soapy water. Apply daily for one week, then cut back to two or three times weekly. Salt cleanses the pores by exfoliation, while the olive oil restores the skin’s natural moisture. If you run out of shaving cream, don’t use soap instead as it could be rough on your skin. Switch to olive oil, which make it easier for the blade to glide over your face or legs and moisturize your skin as well. Restore the smoothness of your wooden furniture by whipping up some serious homemade furniture polish that’s just as good as any of the commercial stuff. Combine 2 parts olive and 1 part lemon juice or white vinegar in a clean recycled spray bottle. Shake it up, and sprits on your wooden furniture. Leave on the mixture for a minute or two, then wipe off with a clean paper towel. If your hair is dry and brittle, put the moisture back into it with olive oil. Heat ½ cup olive oil (do not boil it), and then liberally apply it to your hair. Cover your hair with a plastic shower cap, and then wrap it in a towel. Let it set for 45 minutes, then wash your hair with shampoo like usual. In Croatia, olive oil is often poured over a bowl of ice cream which enhances the taste. Just be sure to drizzle only premium extra virgin olive oil to get the perfect taste. This works best with premium vanilla ice cream and a pinch of sea salt. Just try it!